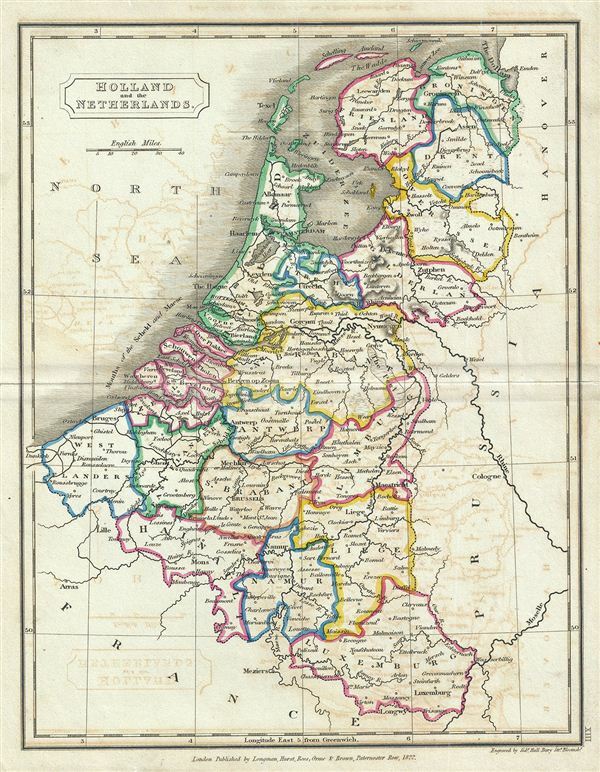 This is a fine example of Samuel Butler's 1822 map of the Netherlands (Holland) and Belgium. It covers all of Belgium and Holland from the North Sea to the Kingdom of France. Just a few years after this map was drawn, the Belgian Revolution of 1830 led to the secession of Belgium from the United Kingdom of Netherlands into the independent Kingdom of Belgium. The map is somewhat detailed with regional boundaries outlined in color. Various towns, cities, rivers, and several other topographical features are noted with relief shown by hachure. This map was engraved by Sidney Hall and published by Longman, Hurst, Rees, Orme & Brown for issue as plate no. XIII in the 1822 edition of Samuel Butler's An Atlas of Modern Geography.